When we board a train or ship railcar freight, we usually don’t think about the hundreds of hours of maintenance and servicing that goes into making railway transportation safe, convenient and efficent. Amsted Rail is one of the railway industry’s leading manufacturers and suppliers of railroad freight car undercarriage, end-of-car systems and components. Amsted services and installs railcar truck systems, wheels, bearings, draft systems, brakes and other components. Amsted Rail required a heavy duty pump to transfer used hydraulic oil at its locomotive servicing facility in Camphill, PA. The pump required a mobility package to move from various service bays, pumping up to 8 ft. suction lift and 20 ft. of horizontal discharge head. 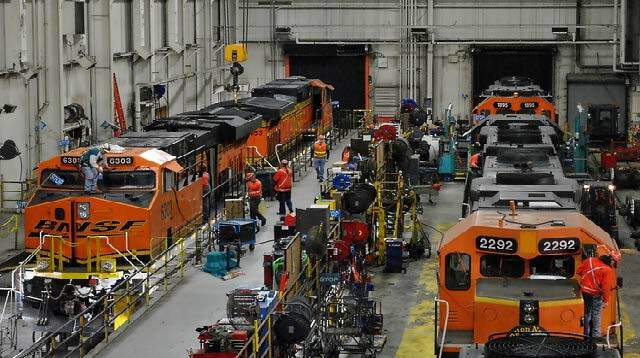 The railroad equipment manufacturing market typically requires servicing pumps capable of high volume workload cycles. Wastecorp. recommended the Mud Sucker 2FA-EC, flapper valve style diaphragm pump for Amsted’s needs. Since the service bay areas are narrow we suggested a mobility package that would move easily without disturbing other maintenance equipment. The 2FA-EC features a 1 hp, single phase Leeson motor with up to 20 GPM fluid handling capabilities. Since the customer would be pumping the hydraulic oil in colder weather as well, we suggested a strainer to improve flow and reduce clogs. Wastecorp Mud Sucker pumps are ideal for restroom septic waste pumping and used oil transfer.